Since 2004, baseball has honored Robinson's barrier-breaking career every April. It is the one day every player on every team wears his retired No. 42 number. Two years ago on Jackie Robinson Day, owner and chairman Mark Walter suggested a sculpture belonged at Dodger Stadium of the six-time All-Star second baseman. Robinson starred when the team was in Brooklyn. "He just felt it was an idea whose time had come," said Janet Marie Smith. She is the team's senior vice president of planning and development. The 77-inch tall bronze statue depicts Robinson as a rookie in 1947 stealing home, a nod to his aggressive baserunning. It weighs 700 pounds and is secured with a 150-pound steel rod. It stands in the left field reserve plaza. Views of downtown Los Angeles can be seen in one direction and Elysian Park in the other. Smith said the location was chosen because it's where the majority of fans enter the hillside ballpark. The park opened 55 years ago. On the statue's granite base are three of Robinson's quotes as chosen by the family. One is wife Rachel's favorite: "A life is not important except in the impact it has on other lives." "This is going to be a very special time," Sharon Robinson said. "My dad was a humble person and here he is 70 years later being recognized. He used to come home and say, 'I got a standing ovation today.' And he would be so shocked." Robinson's statue at the ballpark is the eighth of him. It is the most of any American athlete, according to two British researchers. In response to "this article," I agree that they should have gave him the statue. One reason I agree is that he was the first black man to play in the major leagues, ending six decades of racial segregation. Another reason is that he was a first-ballot Hall of Famer. It says in the article since 2004, baseball has honored Robinson's barrier-breaking career every April. A third reason it is the one day every player on every team wears his retired No. 42 number. I think it is cool that they did that for him. In response to "Jackie Robinson gets statue at Dodger Stadium," I agree that it was a good idea to have a statue of him. One reason I agree is that he was the first black man to play in the major leagues. Another reason is to both celebrate Jackie Robinson as an athlete and to acknowledge the important role he had in civil rights and social change in America. A third reason is he is the most of any American athlete. Even though it weighs 700 pounds, I think it was a great idea to have a statue of Jackie Robinson at Dodger Stadium. In response to "Jackie Robinson gets Statue at Dodger Stadium," I agree that Jackie Robinson deserves a statue at the entrance of the Dodger Stadium. One reason I agree is that he is in the hall of fame, and that is a good reason to get a statue. Another reason is that he made history by becoming the first African-American to play baseball in the majors, and that should be rewarded. It says in the article that the Dodgers wanted to "acknowledge the important role he had in civil rights and social change in America." A third reason is because he was a really good second baseman. He was arguably one of the greatest ever. Even though some people are skeptical about Jackie, I think that he definitely was one of the greatest of all time and deserves to have a statue. 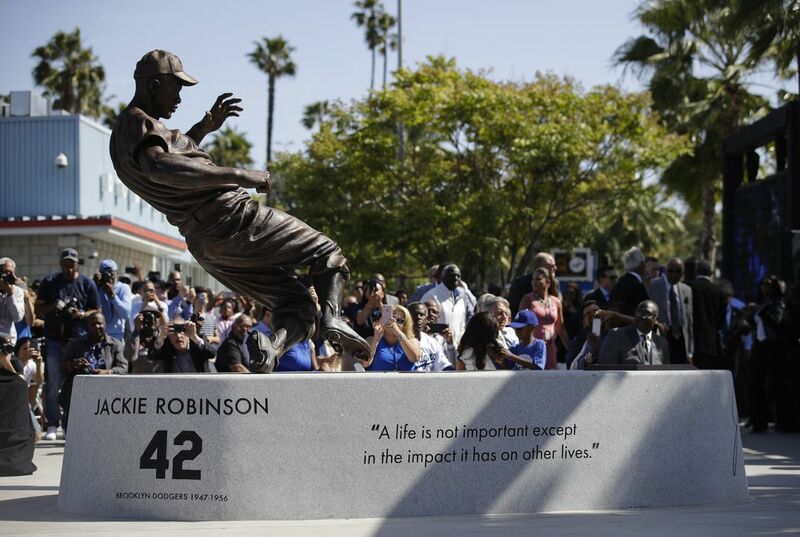 jackie robinson gets a statue outside dodger stadium. My opinion of the article is that it was interesting because it talked about the history of jackie robinson being in the majors and the history of various statues of him. My first piece of evidence that supports the history of jackie robinson being in the majors reads:" The 77-inch tall bronze statue depicts Robinson as a rookie in 1947 stealing home, a nod to his aggressive baserunning" this helps support my claim of jackie robinson being in the majors. My second piece of evidence that supports my claim of jackie robinson's history being in the majors: "Fittingly, Jackie Robinson is the first to be honored with a statue at Dodger Stadium in Los Angeles. 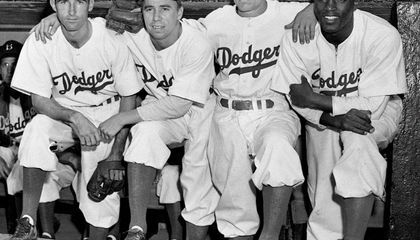 It was unveiled April 15 on the 70th anniversary of his debut with the Brooklyn Dodgers" this shows that it was the 70th anniversary of his mlb debut, supporting my claim of his history in the mlb. My third and final piece of evidence that supports my claim of his history in the mlb: "This is going to be a very special time," Sharon Robinson said. "My dad was a humble person and here he is 70 years later being recognized. He used to come home and say, 'I got a standing ovation today"
this shows how the history of major league baseball consists of the history of jackie robinson and his accomplishments. In conclusion these 3 pieces of evidence support my climb of how the history of the mlb and the history of jackie robinson's career are intertwined. Baseball can affect civil rights because at the time it was only white people that were allowed to play. But when other races were able to play people realized that we aren't so different and we can actually work together. I feel like this is important because he was the first black player to play in the MLB and it somewhat showed that segregation was not need and that it was never needed, and that white people and black people can do the same thing. Jackie was the first black MLB player and it shows how his color didn't effect how he played but because of his skin color he was held back from his full potential. the statue will shower how far our country has come. It showed that not only white people could play basesball, so can black people and not just because of your skin. Jackie Robinson was standing up for black people rights. Baseball could affect civil rights by coaches and teams favoring whites instead of blacks. Baseball also affects civil rights by favoring a race over another and by humans that play baseball favoring some people over others over their color or their actions. My opinion on this article is that I enjoyed this article because it shows that blacks matter and that you can accomplish anything that you want if you put in the effort and you don't care what other people think or say about you. As long as you put in dedication and hard work you can achieve anything even if your a different color. Baseball could affect civil rights by people mistreating the blacks. Coaches, teammates, and opponents should not treat people by their skin color. With Jackie Robinson being the first black baseball player had a big affect on how black people play baseball today. I believe that this is a very interesting article about Jackie Robinson. I really liked this article.